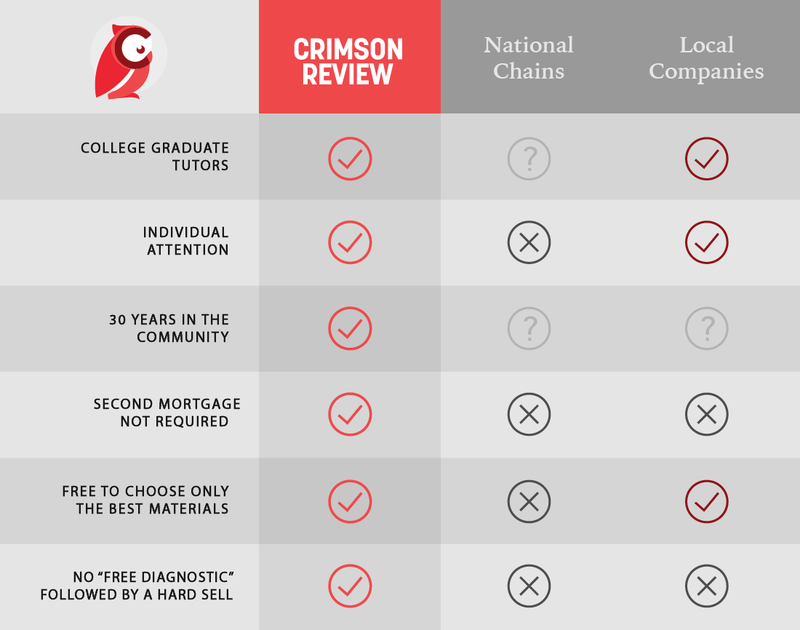 For over 30 years, Crimson Review has been helping students do their best on college entrance exams. With affordable rates and top-notch tutors, our personalized programs are an incredible value. We expect our students to succeed. Our students regularly improve over 150 points or reach the 99th percentile. Our students have been accepted at all the most selective schools in the country, including all the Ivy League colleges, and we’ve had numerous students achieve perfect SAT and ACT scores. Register for the Summer Bootcamp by April 30 and save $150! We offer options to fit each student’s unique needs, from practice exams to group classes to one-on-one instruction. We have years of experience with the current ACT. We will work with each student to bring out their best in all subject areas. We offer individual instruction and small group courses to help students do their best on the ISEE, SSAT, or HSPT. For over three decades, we’ve helped students in the Wayne and Malvern area make the most out of their academic career. We expect and plan for our students to thrive. From perfect SAT scores to Ivy League acceptance letters, Crimson Review alumni receive only the best. With most students improving their scores over 150 points, and many jumping more than 200, it’s no wonder why our students gain acceptance into their first-choice college. We have the tools, talent and resources needed to formulate the best line of attack for test day. Every one of our tutors started out as a student who scored at the top of the range on their own standardized tests, so they know the ins and outs of what your child is facing. Let our tutors lead your child to supercharged SAT and ACT scores. With so many years under our belt, we’ve refined our approach to standardized tests. We offer both group classes and one-on-one sessions covering everything that appears on the tests, so your student can get the attention and tailored curriculum that they need to succeed. Each of our instructors goes through ongoing training so they can teach the materials with our tried and true methods. This also allows for a seamless transition if a student needs to schedule around vacation or work with a different instructor. With two convenient locations in Wayne and Malvern, we see students from all over the Main Line area including Radnor, Newtown Square, and West Chester, Chester Springs, Havertown, and Wallingford. We want students to thrive with whatever challenge they’re facing, so we supply them with the guidance, knowledge, and materials they need to succeed. From test prep to essay tips, we show kids what they’ll come across on their assessment, be it SAT, ACT, or SSAT and ISEE Upper- Level exams, so they’re prepared and confident when test day comes around. Discover how we can help your student reach their full potential. Give us a call at 610.688.6441. Over 30 years of serving the Main Line community. Our instructors are all college graduates, from schools such as the University of Pennsylvania, Johns Hopkins, NYU, and Wesleyan. Crimson Review is not a franchise and is not owned by a large corporation. We are free to choose the best materials, regardless of source. Students get 1-1 attention with our Full and Private courses.